The announcement that Microsoft CEO Steve Ballmer will retire “within the next 12 months” prompts some quick reflections on Ballmer and the state of his company. Ballmer suffers from lack of charisma on stage, and this combined with missteps like failing to compete effectively in mobile devices, nearly buying Yahoo at a ludicrous price, the Kin debacle, making far too many Surface RT devices, and the poor reception overall for Windows 8, means that Ballmer’s time as CEO may be judged harshly. Many commentators seemingly forget that Microsoft’s financial results under Ballmer have been generally excellent. Further, if we blame Ballmer for the various blunders that occurred during his time as CEO, we should also credit him for the successes, like Windows 7, the steady improvements in Windows server, and the market success of Xbox versus Sony PlayStation (though not forgetting the red ring of death nor the numerous loss-making quarters for entertainment and devices). Nor would it be correct to portray the Ballmer years as conservative turn-the-handle profit making from Windows and Office. Under Ballmer, Microsoft is transitioning towards the cloud with Office 365 and Windows Azure (with considerable success), and he was willing to take bold steps with both Windows (“reimagined” in Windows 8) and Office (moving towards a subscription model). We are rallying behind a single strategy as one company — not a collection of divisional strategies. Although we will deliver multiple devices and services to execute and monetize the strategy, the single core strategy will drive us to set shared goals for everything we do. We will see our product line holistically, not as a set of islands. We will allocate resources and build devices and services that provide compelling, integrated experiences across the many screens in our lives, with maximum return to shareholders. All parts of the company will share and contribute to the success of core offerings, like Windows, Windows Phone, Xbox, Surface, Office 365 and our EA offer, Bing, Skype, Dynamics, Azure and our servers. What should the new CEO, and Ballmer in his final months, do now? I will refer to you to this interview with Scott Guthrie about what happened when he was reshuffled, along with several other Microsoft execs, to take on Windows Azure. Just to remind you, Azure was not a success when first launched, being both difficult to use and poorly presented by Microsoft. We did an app building exercise about a year ago, my second or third week in the job, where we took all the 65 top leaders in the organisation and we went to a hotel and spent all day building on Azure," said Guthrie. "We split up everyone into teams, bought a credit card for each team, and we said: ‘You need to sign up for a new account on Azure and build an app today. It was an eye-opening experience. About a third of the people weren’t able to actually sign up successfully, which was kind of embarrassing. We had billing problems, the SMS channel didn’t always work, the documentation was hard, it was hard to install stuff. Azure was based on decent technology, but prior to the changes Guthrie describes, it was a relatively hostile platform for developers. Put another way, it was not so much the strategy that was wrong, as the way it was executed. I recall similar comments from the former Windows chief Steven Sinofsky about how Windows 7 was designed, based on what users found annoying in Windows Vista. Something I see frequently at Microsoft is good ideas poorly executed or spoilt by errors of detail, and Ballmer could have done more to insist on higher standards. Recently I have been working with Office 365, and while the underlying platform is strong, working with it can be infuriating. It needs Guthrie’s approach: get people to try the product, watch what goes wrong, and fix it. Microsoft’s devices and services strategy makes a lot of sense but the company needs more attention to detail to make it work. Microsoft has announced that Bob Muglia, President of Server and Tools, is leaving Microsoft. Bob Muglia and I have been talking about the overall business and what is needed to accelerate our growth. In this context, I have decided that now is the time to put new leadership in place for STB. This is simply recognition that all businesses go through cycles and need new and different talent to manage through those cycles. It is always hard to tell from the outside, but in my encounters Muglia has been among the most articulate and confident of Microsoft’s top executives. I have also noticed in my regular look at Microsoft’s financials that the Server and Tools business has performed consistently well for as long as I can remember. Most recently, Muglia took over the Azure business and seemed to know where he was going with it. He is also responsible for developer tools, and while his remarks about Silverlight at Microsoft’s PDC in November were disappointing to developers on that platform, they showed a clear sense of direction. In this context, it seems surprising that Ballmer is in search of “new and different talent”. It does sound as if Ballmer and Muglia do not see the future of the cloud business – which is the focus of the memo – in the same way. 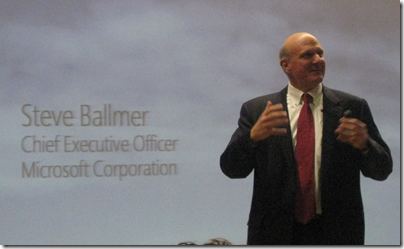 The key question: in what way did Ballmer and Muglia’s vision differ? I guess we will get some more clues as today’s news is discussed. Later this year, I’m moving on to new opportunities outside of Microsoft, so I wanted to take a few minutes to share with you what’s important to me in life and leadership. Just sugar, or did Muglia feel that staying at Microsoft would compromise those principles? This morning Microsoft CEO Steve Ballmer spoke at the London School of Economics on the subject of Seizing the opportunity of the Cloud: the next wave of business growth. Well, that was supposed to be the topic; but as it happened the focus was vague – maybe that is fitting given the subject. Ballmer acknowledged that nobody was sure how to define the cloud and did not want to waste time attempting to do so, “cloud blah blah blah”, he said. It was a session of two halves. Part one was a talk with some generalisations about the value of the cloud, the benefits of shared resources, and that the cloud needs rather than replaces intelligent client devices. “That the cloud needs smart devices was controversial but is now 100% obvious,” he said. He then took the opportunity to show a video about Xbox Kinect, the controller-free innovation for Microsoft’s games console, despite its rather loose connection with the subject of the talk. Ballmer also experienced a Windows moment as he clicked and clicked on the Windows Media Player button to start the video; fortunately for all of us it started on the third or so attempt. 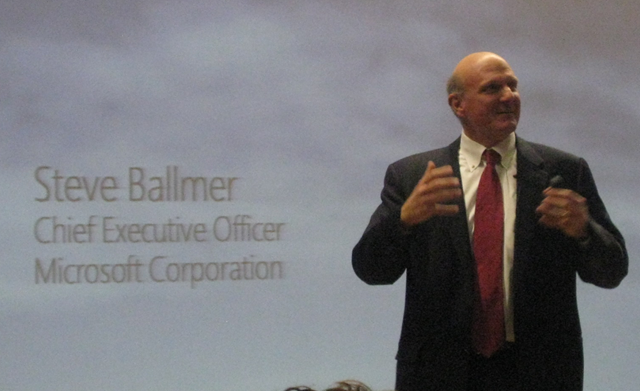 Just when we were expecting some weighty concluding remarks, Ballmer abruptly finished and asked for questions. These were conducted in an unusual manner, with several questions from the audience being taken together, supposedly to save time. I do not recommend this format unless the goal is to leave many of the questions unanswered, which is what happened. Some of the questions were excellent. How will Microsoft compete against Apple iOS and Google Android? Since it loses money in cloud computing, how will it retain its revenues as Windows declines? What are the implications of Stuxnet, a Windows worm that appears to be in use as a weapon? Ballmer does such a poor job with such questions, when he does engage with them, that I honestly do not think he is the right person to answer them in front of the public and the press. He is inclined to retreat into saying, well, we could have done better but we are working hard to compete. He actually undersells the Microsoft story. On Stuxnet, he gave a convoluted answer that left me wondering whether he was up-to-date on what it actually is. The revenue question he did not answer at all. There were a few matters to which he gave more considered responses. One was about patents. “We’re better off with today’s patent system than with no patent system”, he said, before acknowledging that patent law as it stands is ill-equipped to cope with the IT or pharmaceutical industries, which hardly existed when the laws were formed. Another was about software piracy in China. Piracy is rampant there, said Ballmer, twenty times worse than it is the UK. “Enforcement of the law in China needs to be stepped up,” he said, though without giving any indication of how this goal might be achieved. He spoke in passing about Windows Phone 7, telling us that it is a great device, and added that we will see slates with Windows on the market before Christmas. He said that he is happy with Microsoft’s Azure cloud offering in relation to the Enterprise, especially the way it includes both private and public cloud offerings, but admits that its consumer cloud is weaker. Considering the widespread perception that Microsoft is in decline – its stock was recently downgraded to neutral by Goldman Sachs – this event struck me as a missed opportunity to present cogent reasons why Microsoft’s prospects are stronger than they appear, or to clarify the company’s strategy from cloud to device, in front of some of the UK’s most influential technical press. I must add though that a couple of students I spoke to afterwards were more impressed, and saw his ducking of questions as diplomatic. Perhaps those of us who have followed the company’s activities for many years are harder to please. Update: Charles Arthur has some more extensive quotes from the session in his report here. Microsoft watchers have been scrutinising the fascinating Mini-Microsoft post on the Kin smartphone debacle and what it says about the company. If it is even slightly accurate, it is pretty bad; and it must be somewhat accurate since we know that the hopeless Kin launch happened and that the product was killed shortly afterwards. Of course it would have been better to kill the project before rather than after the launch; the negative PR impact has affected the strategically important Windows Phone 7 launch. Handsome profits from Windows and Office have enabled Microsoft to survive and even prosper despite mistakes like Kin, or the Xbox 360 “red ring of death”, or the Vista reset and related problems – mistakes on a scale that would sink many companies. I see frequent complaints about excessively bureaucratic management with too many layers, and a tendency towards perplexing, ineffective but expensive advertising campaigns. 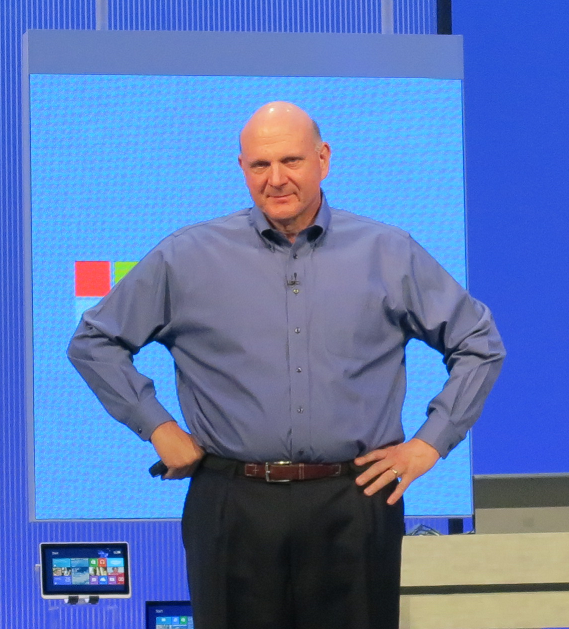 There are also questions about CEO Steve Ballmer’s suitability for the task. He nearly indulged in a disastrously over-priced takeover of Yahoo, saved only by the obstinacy of the target company’s leadership. He habitually dismisses the competition, such as Apple’s iPhone, and is proved wrong by the market. He failed to see the importance of cloud computing, and even now that the company is at least partially converted he does not set the right tone on the subject. I watched his keynote at the Worldwide Partner Conference (WPC) where he sounded as if he were trying unsuccessfully to imitate Salesforce CEO Marc Benioff from ten years’ ago. Microsoft needs to present a nuanced message about its cloud initiative, not someone shouting “oh cloud oh cloud oh cloud”. Microsoft is also copying its competition as never before. Bing has a few innovations, but is essentially a recognition that Google got it right and an attempt to muscle in with a copy of its business model – search, advertising and data mining. Windows Phone 7 occupies a similar position with respect to Apple’s iPhone and App Store. Windows 8 also seems to borrow ideas from Apple. Nevertheless, Microsoft is not yet a dying company, and it would be a mistake to base too much analysis of the company on something like comments to Mini-Microsoft’s blog – good though it is – since it is a magnet for disaffected employees. While Ballmer’s effort at the WPC was poor, he was followed by Bob Muglia, president of server and tools, who was excellent. Windows Azure has come on remarkably since its half-hearted preview at PDC 2008; and Muglia comes over as someone who knows what he is trying to achieve and how he intends to get there. The Azure “Appliance” idea, shipping a pre-baked cloud infrastructure to Enterprise customers, is a clever way to exploit the demand for a cloud application model but on hardware owned by the customer. The eBay announcement at WPC was also quite a coup. eBay will “incorporate the Windows Azure platform appliance into two of its datacenters” later this year; and while it is not clear exactly how much of eBay will run on Azure, these appliance kits represent significant hardware. We’ve seen other strong releases from Microsoft – server 2008 R2, Exchange 2010, SQL Server 2008 R2, SharePoint 2010 which whatever you think of SharePoint is a solid advance on its predecessor, and of course Windows 7 which has done a lot to rescue Microsoft’s performance and reputation after the Vista disappointment. 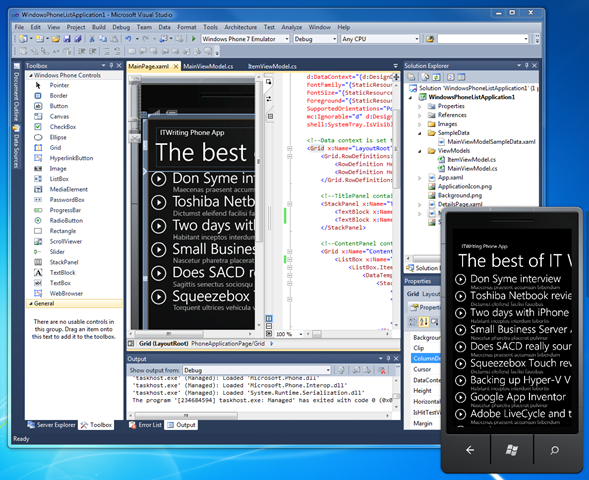 I also continue to be impressed by Visual Studio 2010, which is a huge release and works pretty well in my experience. What about Windows Phone 7? With the market focused on iPhone vs Android, clearly it is in a tough market. If there is something slightly wrong with it on launch, instability or some serious hardware or software flaw, it might never recover. Nevertheless, I do not write it off. 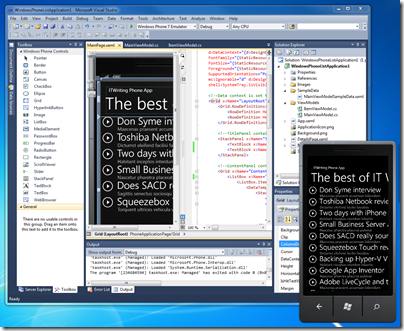 I think the design effort is intelligent and focused, and that the Silverlight/XNA/.NET development platform along with Visual Studio is an attractive one, especially for Microsoft Platform developers. VP Scott Guthrie describes the latest SDK here. People still switch phones frequently – something I dislike from an environmental point of view, but which works in favour of new entrants to the market. If Windows Phone 7 is a decent device, it can succeed; I’d rate its long-term chances ahead of HP WebOS, for example, and will be keen to try it when it becomes available. Is there a lot wrong with Microsoft? Yes. Does it need a fresh approach at the very top? Probably. Nevertheless, parts of the company still seem to deliver; and even the Windows Phone 7 team could be among them.